The 14th edition of the Men’s Hockey World Cup field hockey tournament is scheduled to be held from 28 November to 16 December 2018. The 16 participating teams have been divided into four groups of four. India have been placed in group C along with Belgium, Canada, and South Africa. 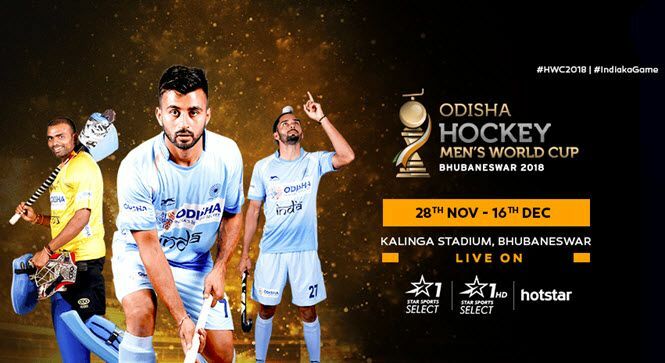 All the matches will be played at the Kalinga Stadium in Bhubaneswar. Check out the complete details of Hockey World Cup 2018 Schedule PDF, Live Streaming, TV Listings, Results, Points Table and more details from the below article. Venue: All the matches of the tournament will be played at Kalinga Stadium in Bhubaneswar, Odisha. How can I watch the Men’s Hockey World Cup 2018 live on TV? The Star Sports Network has the broadcasting rights for the 2018 Hockey World Cup alongside Doordarshan in India. We will update the day to day, match to match results and points table of 2018 Men’s Hockey World Cup on this page. So, stay tuned to this page. Meanwhile, you can check the below official website link to know about the latest news of Hockey World Cup 2018 India. Hope you like this Men’s Hockey World Cup 2018 Full Schedule, Watch Online, Results and Points Table information. If you like this, then please share it with your friends.